Healers are great troops do maximize your attacks. 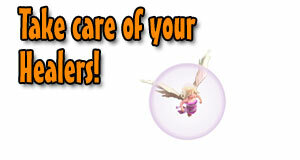 Used with a good strategy like the giant-healer strategy requires you to look out for air defenses. The air defenses are the healers greatest enemy. Make sure to take those out first. Normally the wizard tower and archer tower will go after your ground troops first before attacking your healer.